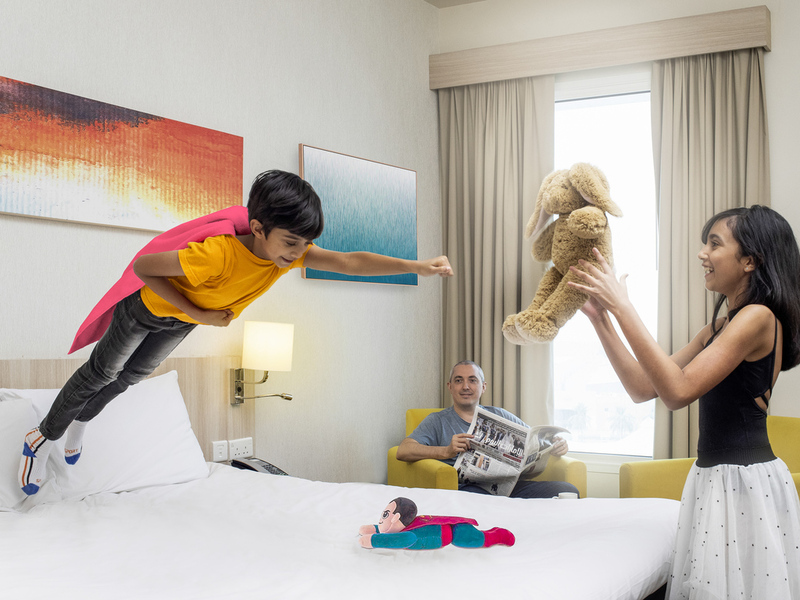 Fun, style and comfort go hand-in-hand at the ibis Styles Dragon Mart Dubai! Solo travellers and families, vacationers and business guests are treated to colourful and inspiring designs throughout the hotel. Our all-inclusive offer combines the best of ibis Styles hospitality, including bed, breakfast and free WiFi at one value price. Our gym, lounge and sports bar are perfect spots for adults to recharge their batteries, while the Kids Corner and TV channels keep the little ones entertained. The hotel is located on Al Awir road (E44), 15-minute drive from Dubai Int'l Airport and a stone's throw away from Int'l City and Dragon Mart. Easily accessible within 10-minute drive from Burj Khalifa, Dubai Mall, Meydan Racecourse, Mirdif City Centre. Warm, welcoming and modern, with a comfortable bed and a practical bathroom, our rooms offer everything you need for an enjoyable stay. Equipped with the new ibis Sweet bed, the hotel offers the ultimate in comfort: cozy bed, desk, sofa, internet, carpet flooring, LCD TV with international channels, a bathroom with shower, tea & coffee making facilities, mini fridge and safe deposit box. The Bricks Sports bar is a stylish and lively Lounge, perfect for an informal drink and light snacks with friends and business associates. 전반적으로 모든게 양호했다. 하지만 슬리퍼나 헤어드라이기가 기본적으로 없는게 아쉬웠고 싱글침대2개로 예약했는데 킹사이즈 1개 침대를 준 건 실망스러웠다.